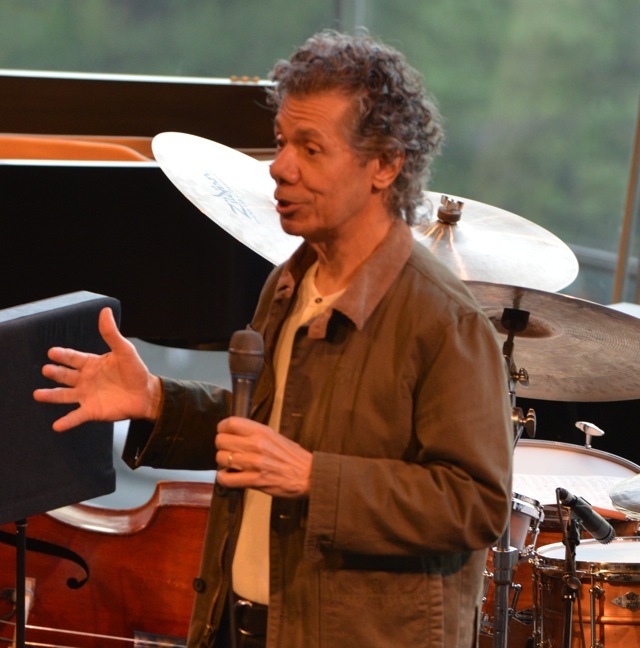 As part of its Friends of Chick Corea line-up Jazz at Lincoln Center (JALC) offered two evenings of two sets featuring 17 year old keyboardists Beka Gochiashvili and Gadi Lehavi, under the banner Musicians of the Future. Along with the legions of budding Beibers out on the Internet there is a growing cadre of gestating jazzers and classicos happy to show their chops so it’s no surprise that Corea was introduced to both these players via YouTube links sent from friends. Though only in their teens both musicians have already amassed impressive résumés. The venue, JALC’s Allen Room, is a very special space to enjoy a show; a unique New York City experience. The room’s mechanical floor can be configured from flat surface to amphitheater style event. Its stories high, venue wide, window looks out over Columbus Circle and affords attendees a view of Central Park looking up Fifth Avenue. It’s an amazing real world backdrop for the stage. As the sun sets, headlight reflections from cars looping around the plaza below create a light-show effect that looks like groups of darting fireflies. The introductory number presented the players in duet. At first engrossed in individual meditative bubbles the pianists quickly reverted to wordless musical communication across the stage with concentrated eye contact breaking into broad grins as the piece progressed. Alternately each got his turn to work in trio and quintet formats with a group chosen by Corea especially for these shows. Bassist John Patitucci acted as MC, introducing the players and the tunes. He and drummer Marcus Gilmore laid down a solid and inspiring rhythm bed for the soloists. 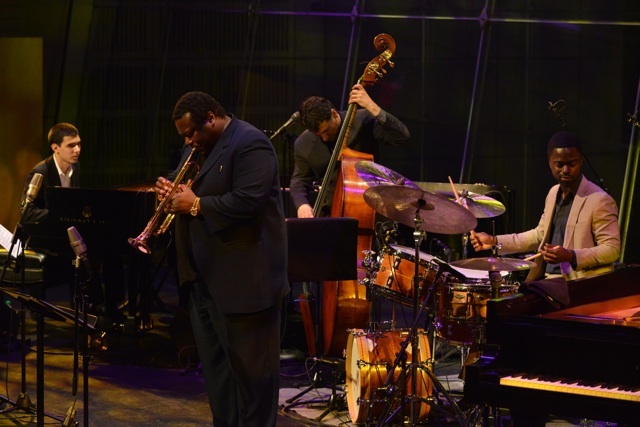 Trumpet Player Wallace Roney and Tenor Saxophonist Ravi Coltrane improvised over extended choruses and in counterpoint on establishing melodies. The showcase leaned heavily on Corea’s Stan Getz and Now He Sings, Now He Sobs era tunes including “Windows,” “Matrix” and the expanded CD edition’s “Samba Yantra.” The Three Quartets album was represented – in quintet – with Quartet 2, Part 2, dedicated to John Coltrane. Lehavi original “January,” a quiet waltz, was presented in trio. On an improvisational level Beka tends to work longer melodic lines, similar to Corea’s work with Getz on tunes like “O Grande Amor,” while Gadi veers toward the percussive side of the instrument reminiscent of Keith Jarrett’s rhythmic explorations. Corea, now a spry septuagenarian, joined the quintet for the final number of the May 18th late show. 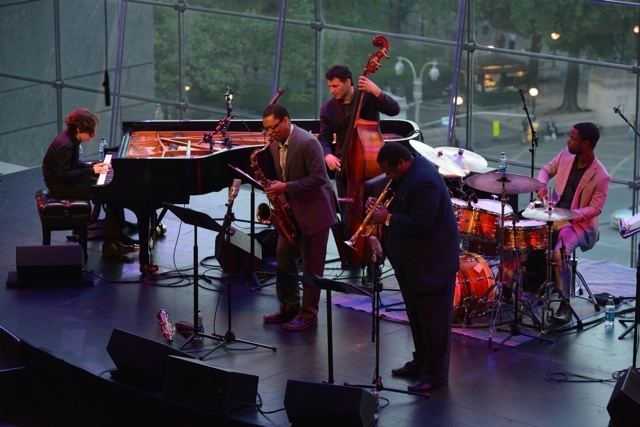 He had just finished his own set in the Rose Theater, the main auditorium of the Jazz At Lincoln Center complex. Beaming with the impish grin of a proud mentor, Corea asked what the last song would be. “Matrix” was the response. “You can’t! We just did that next door” he jibed, then jumped on the piano stool next to Gadi and initiated the melodic lines of the tune, stopping to let each of the young men pick up the piece in round. As the tune progressed Corea alternated between playing alongside each of the teens, plucked inside the grand pianos to embellish a solo line, and tapped out patterns to suggest rhythm changes. Lehavi and Gochiashvili are two technically strong players who have nearly a century of Jazz history to mine and an open road ahead to translate and invent. As with any tribute show, it is hard for the musicians to know where homage ends and exploration, even demolition, should begin. It is interesting to note that only after Corea joined in did a real feeling looseness and “self” truly appear in each player. With Chick on stage, neither had to represent or “be” him in the mix. The good news is that – as with any successful coming out party – Gochiashvili and Lehavi transcended the physical and musical surroundings to be the highlights of the show. JALC ends the current season with Swinging With The Big Bands, on June 12 and 13, 2013. Crooner/pianist Michael Feinstein will host featured performers Wynton Marsalis, Vince Giordano and the Nighthawks, Connie Evingston, Sachal Vasandani, and a favorite of mine Nellie McKay who will put their spin on 1930’s era jazz/pop. Spotify users can sample a playlist of the artists involved. The 2013-2014 season schedule has been announced and tickets and subscriptions are available now at JALC.org.